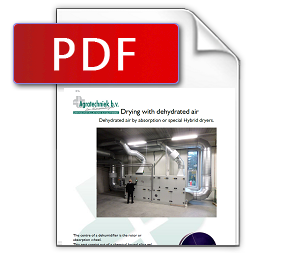 Dehumidification of air by adsorption. Air can be dried to a low moisture level by adsorption. Drying or dehumidifying by means of adsorption concerns the binding of moisture in the air to a moisture-adsorbing material such as silica gel. The centre of an adsorption dehumidifier is the rotor or adsorption wheel. This part consists for 82% out of a chemical bound silica gel that can adsorb moisture out of the process air that passes through the rotor. 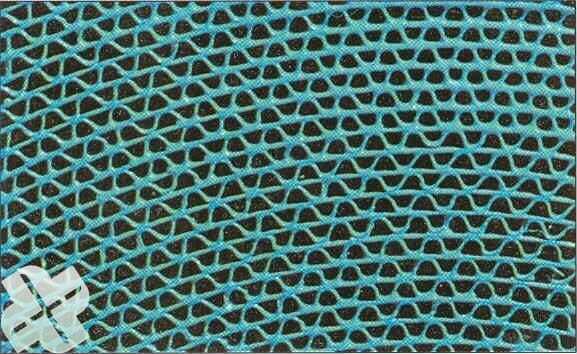 The structure of the rotor looks like a honeycomb pattern with a lot of small air channels. All these air channels make a big adsorption surface which takes care of the dehumidification of the air that passes the rotor; the silica gel adsorbs water from the air. The same rotor can also release moisture during the regeneration process. The dryer is therefore divided in 2 levels. The rotor adsorbs moisture in the level for process air. The rotor turn in the level for the regeneration process where the rotor is being dried. After the regeneration process the rotor is ready to adsorb moisture again. The silica gel in the rotor cannot adsorb water unlimited. Nevertheless the adsorption and regeneration process is a continuing process. To make the adsorption process a continuing process the construction of the rotor is designed to adsorb water at 75 or 50% of the total surface of the wheel (level for process air). 25 or 50% (depending the T° of the regeneration air) of the rotor is used for regeneration process (drying the rotor). Rotor with 75-25 configuration; regeneration by hot air (150°C) from gasburner ad 25% of the rotor surface. 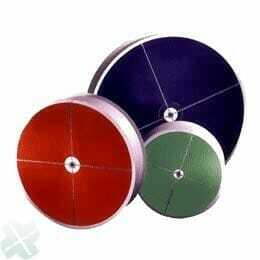 Rotor with 50-50 configuration; regeneration by warm air (60-80°C) from hot water battery or condensor. By rotating, each part of the rotor will adsorb water and will later be dried by regeneration. The regeneration section is isolated from the adsorption section. By blowing hot air through the regeneration section, the adsorbed water will be removed from the rotor. The moist regeneration air will be evacuated through air-channels to outdoors. 7: Moist regeneration air will be evacuated to outdoor. Option I) 8: Heat exchange unit brings proces air T° down to the ambiant level + 3°C. Free coming energy will be used to warm up regeneration air; Energy saving. The hybrid air dryer is specially developed to create very dry air with an constant (low) temperature (20-15°C) of the process air. Process air is first being cooled, so water in the process air will condensate on the evaporator. After this, the process air at 100% HR will be dried to a low level by the Adsorption rotor. 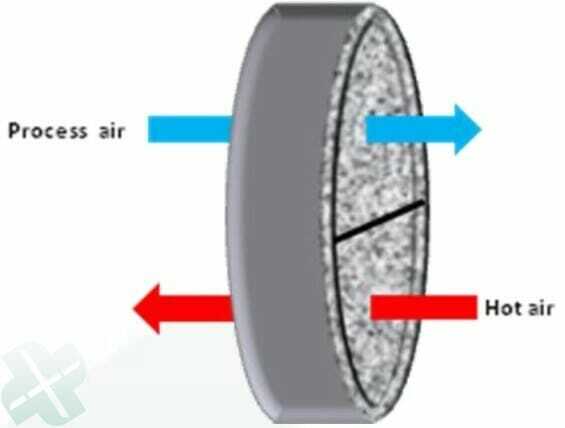 Because of high HR, the capacity of the adsorption rotor is at its maximum. 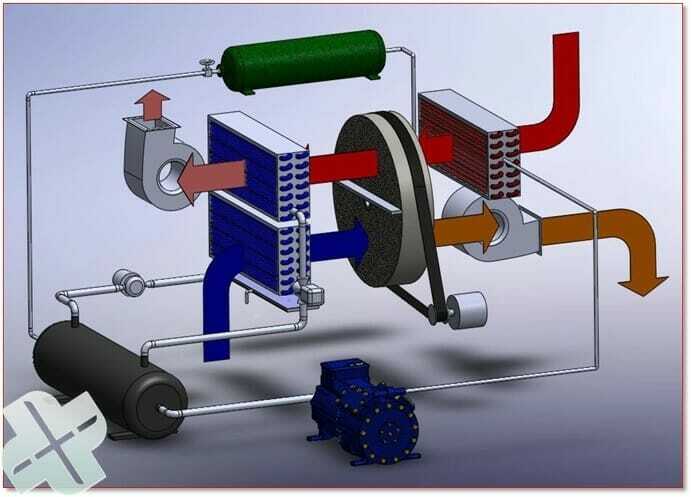 Energy from cooling and condensation of the process air will be provided by the first heat pump to the condenser and liquid cooler. Air for regeneration (drying of the rotor) will be heated by this condenser and liquid cooler. After passing the rotor the regeneration air is wet and warm. This air contains a lot of energy. By cooling the air and condensation of the water, the maximum of energy will be taken from the regeneration. By a second heat pump, this air will also being provided for regeneration. No external extra heating is needed and all energy will be used; energy saving! The airflow for the process air is variable. When the airflow has reached its minimum and is still more than desired, the process air will return automatically to be used for regeneration. Again energy saving!! 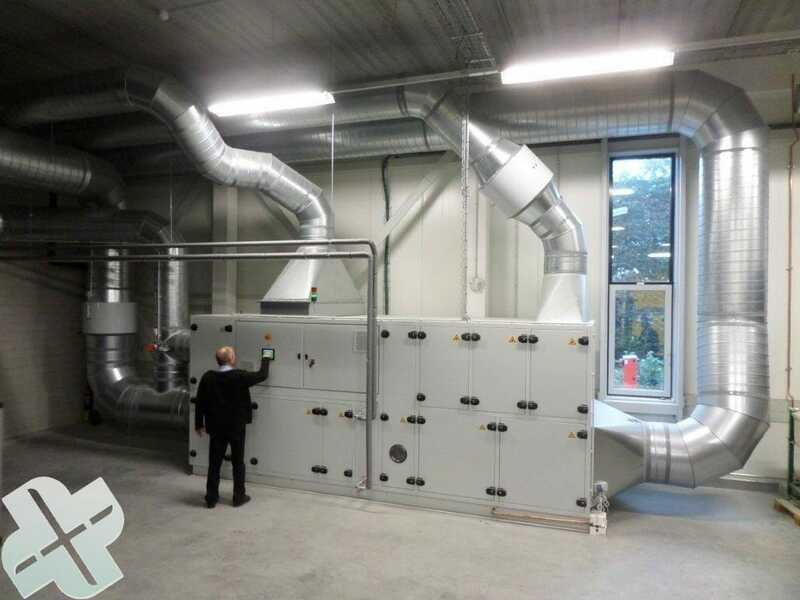 To reach dry and cold air (10°C with 30% HR or 15°C with 20% HR) for long storage of seed, the hybrid air dryer will be provided with an aftercooler; The dry process air will be cooled by a third evaporator to be cooled to the low temperature. Ideal for the different storage rooms and the seed vaults. The hot process air (till 40-50 T°C) can be cooled down by a cross-flow air/air heat exchanger; The hot process air crosses the sucked in cold outside air by slats. The energy of the process air will be given to the colder outside air. 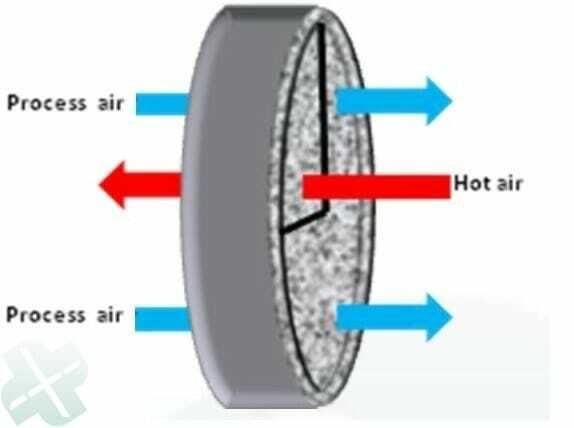 The process air will cool down till 3 T°C above the temperature of the outside air. The heated outside air will be used for regeneration so that the subtracted energy can be used economically. In the adsorption dryer, two water/air heat exchangers (radiators) can be placed. The sucked in process air will be cooled down in the radiator by using cold water. The regeneration air will be heated in the radiator by using hot water from the chiller. If there is a central heating present, the regeneration air can be heated by a radiator by using hot water. 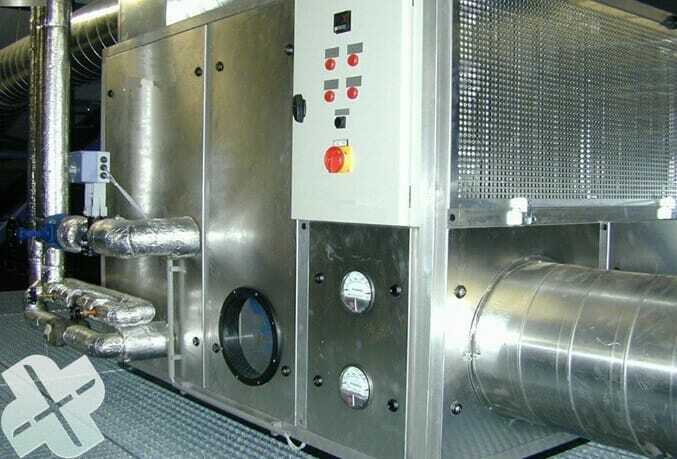 The process air can be cooled down with an air/air heat exchanger (shown above). By using current delivered by windmills or solar panels, regeneration with electrical heating can be economic. The process air can be cooled down again with an air/air heat exchanger (shown above).